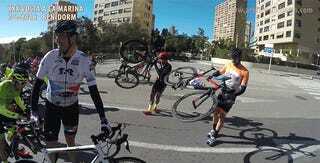 Everything seems to be going swimmingly in this stage of the Volta La Marina in Benidorm but then all of a sudden the cyclists fall off pace of the car and seem to be slowing down to a legitimate crawl and then basically hit a full stop all at once. What happened? It was the wind. The strong winds pushed against the cyclists stopping them in their tracks and even blowing some backwards. The race was suspended because of it.